Rachel’s journals and emails from her time in Palestine are available in a variety of forms. They have been published in books, turned into plays and dramatic readings, and used around the internet. They are not always reproduced in their entirety and we have collected them here, un-cut, for easier reading. Read Rachel’s emails from Palestine. 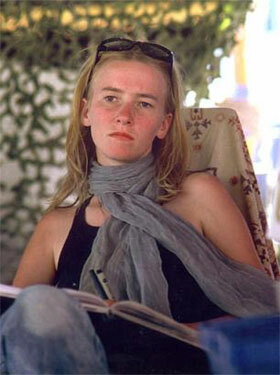 Electronic Intifada has a detailed photo story regarding Rachel’s killing in Rafah, a list of links to subsiquent court actions, Eyewitness reports and official statements and numerous articles on Rachel Corrie. MIFTA.org has set up a tribute page that includes several photographs and links to articles. It’s fitting that “THE CLEAN HOUSE” and “MY NAME IS RACHEL CORRIE” start performances on Thursday, since each play, in very different ways, raises the same question: What took so long? “Rachel’s Words” was an event that took place on March 22, 2006 at Riverside Church in New York City to in response to the postponement of the New York Theater Workshop’s production of “My Name is Rachel Corrie.” The play was scheduled to open at the New York Theatre Workshop on March 22nd but was “postponed indefinitely” due to political pressures. The “Rachel’s Words” movement was made up of a broad spectrum of groups and individuals who believed that Rachel’s words and her message of human rights and justice should be heard.